This is quite a complex and layered beer. Bold and smooth chocolate malt flavors combine with a Belgian yeast lending tropical fruit/banana flavors and hints of spiciness, all complemented by citrus notes from an addition of tangerine peel. Rich vanilla beans add a nice counter to the chocolate malt - actually enhancing the chocolatiness. The finish is smooth, with additional traces of vanilla and toasted characters from French Oak. 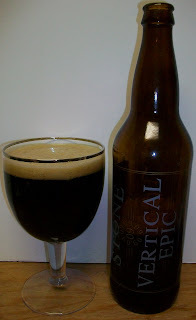 The goal for this edition of the Stone Vertical Epic Ale series is to be reminiscent of artisanal chocolates accentuated with orange. This is a very interesting series for Stone. I believe they started in 02-02-02 but sadly this is the first year that I discovered it. At least now I have something to look forward to the October when they release the 10-10-10. This is a first of a two-parter, if you will. I have been aging or cellaring a bottle of this for a few months now. But in order to appreciate how it cellared I thought I needed to buy another bottle to review now. So when it comes time to review the aged one I will have a review to compare it to. This beer pours a very dark brown pitch black completely opaque with no light showing through anywhere on the glass. The beer has a low but very rich looking dark tan head. I could smell the wonderful nose of this beer as soon as I started pouring it. There are rich dark roasted malts on the nose. The malts are a combination of traditional stout like and Belgian like malt aromas. There is also some dark fruit, coffee and chocolate notes on the nose. This is an extremely inviting nose; I can’t wait to dive into it. Wow, another very unusual beer. Very heavy roasted malts but more like a spice stout then a Belgian Strong Dark Ale. Don’t get me wrong, this is good, very good but I was expecting more complexity from the Belgian yeast. At any rate let me give you the play by play on the taste. It starts out with sweet roasted malts upfront, just behind or more like on top of that is some spicy notes all still in that initial upfront, first tip of the tongue taste. Then a very smooth middle of the sip with a back-end that is a building malt bitterness but still fairly smooth and not overpowering. The finish is just wonderful with roasted malts, spices, hop bitterness, malt bitterness and a very nice classic stout-like malt coating all over your mouth. This is a good beer. However it is not a very smooth drinking beer. With all of these roasted malt flavors you would expect it to be a little smoother than it is. As this beer warms it seems to be getting more bitter and less smooth. Again I would expect this beer to get smoother as it warms not more bitter. Rating will be difficult simply because this beer does not taste like a Belgian Strong Dark Ale. It is a very good malty ale but it does not have the dark fruit complexity and esters that you would expect in a Belgian Dark. I am going to settle for a B on this one. It is a very good beer and I probably would give it a higher rating if were classified as something other then a Belgian Strong Dark. It will be interesting to see with happens to this beer after cellaring for a year or more.